Navaratri is celebrated four times a year. They are Vasanta Navaratri, Ashadha Navaratri, the Sharada Navaratri, and the Paush/Magha Navaratri. Of these, the Sharada Navaratri of the month of Puratashi and the Vasanta Navaratri of the Vasanta kala are very important. 1. Vasanta Navaratri: Basanta Navrathri, also known as Vasant Navratras, is the festival of nine days dedicated to the nine forms of Shakti (Mother Goddess) in the spring season (March–April). It is also known as Chaitra Navratra. The nine days of festival is also known as Raama Navratri. 2. Gupta Navaratri: Gupta Navratri, also referred as Ashadha or Gayatri or Shakambhari Navratri, is nine days dedicated to the nine forms of Shakti (Mother Goddess) in the month of Ashadha (June–July). Gupta Navaratri is observed during the Ashadha Shukla Paksha (waxing phase of moon). 3. Sharada Navaratri: This is the most important of the Navratris. It is simply called Maha Navratri (the Great Navratri) and is celebrated in the month of Ashvina. Also known as Sharad Navaratri, as it is celebrated during Sharad (beginning of winter, September–October). 4. 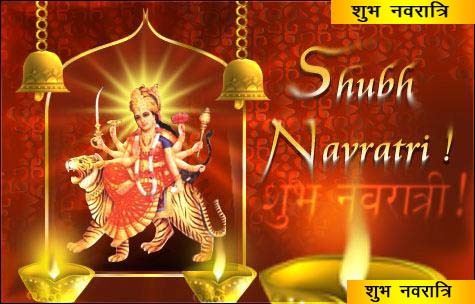 Paush Navaratri: Paush Navratri is nine days dedicated to the nine forms of Shakti (Mother Goddess) in the month of Paush (December–January). Paush Navaratri is observed during the Paush Shukla Paksha (waxing phase of moon). 5. Magha Navaratri: Magha Navratri, also referred as Gupta Navratri, is nine days dedicated to the nine forms of Shakti (Mother Goddess) in the month of Magha (January–February). Magha Navaratri is observed during the Magha Shukla Paksha (waxing phase of moon). The Navratri commences on the first day (pratipada) of the bright fortnight of the lunar month of Ashvin. The festival is celebrated for nine nights once every year during the beginning of October, although as the dates of the festival are determined according to the lunar calendar, the festival may be held for a day more or a day less. Navaratri is celebrated in different ways throughout India. In North India, all three Navratris are celebrated with much fervor by fasting on all nine days and worshipping the Mother Goddess in her different forms. The Chaitra Navratri culminates in Ram Navami and the Sharad Navratri culminates in Durga Puja and Dussehra. The Dussehra of Kulu in Himachal Pradesh is particularly famous in the North. 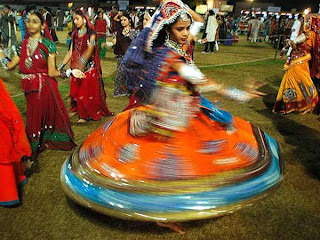 Navratri festival in Gujarat is one of the main festivals. Garba is dance which people use to dance after the Durga Pooja with the groups and live orchestra or devotional songs. The last four days of Sharad Navratri take on a particularly dramatic form in the state of West Bengal in East India where they are celebrated as Durga Puja. This is the biggest festival of the year in this state. Exquisitely crafted and decorated life-size clay idols of the Goddess Durga depicting her slaying the demon Mahishasura are set up in temples and other places. These idols are then worshipped for five days and immersed in the river on the fifth day. 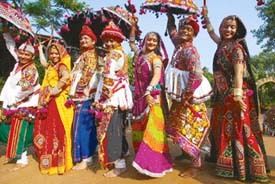 In Western India, particularly in the state of Gujarat, Navratri is celebrated with the famous Garba and Dandiya-Raas dance. 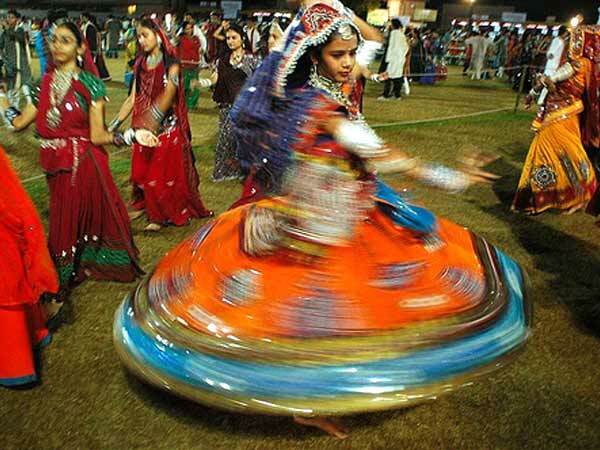 Since the past few years, the Government Of Gujarat has been organising the "Navratri Festival Celebrations" on a regular basis for the nine days of Navratri Festival in Gujarat. People from all over Gujarat and even abroad come to participate in the nine days celebrations. It is also popular throughout India and among Indian communities around the world including the UK and USA. In Goa, zatra begins during Navratri, entire Antruz (Ponda) is highly ornated. The Saraswat Brahmin temples are beautifully decorated and the idols are taken out for worship. The idols are dressed and adorned with flowers, sandalwood paste, turmeric and kumkum. Devotees come during Navaratri to get the special darshan and what mostly a devotee awaits is the Kaul Prasad, which is as something given from the Gods and Goddess itself. The Deities are emblazoned with flowers and devotees or priests continue to worship the deity without even changing the flowers on them. At the end of the festive night the flowers are distributed as Prasad for the devotees. The Dasha Maitrikas (the 10 sisters of Goa) of the Saraswat Brahmins are taken out to worship - namely, Shantadurga, Aryadurga, Mahalasa, Katyayani, Mahamaya, Kamakshi, Vijayadurga, Bhumika, Mahalakshmi and Navadurga. In South India, people set up steps and place idols on them. This is known as golu. Photos of typical Golu displayed in Tamil Nadu style at a home in Nerul, Navi Mumbai, Maharashtra, India is shown by the side. In Kerala, three days: Ashtami, Navami, and Vijaya Dashami of Sharad Navaratri are celebrated as Sarasvati Puja in which books are worshipped. The books are placed for Puja on the Ashtami day in own houses, traditional nursery schools, or in temples. On Vijaya Dashami day, the books are ceremoniously taken out for reading and writing after worshipping Sarasvati. Vijaya Dashami day is considered auspicious for initiating the children into writing and reading, which is called Vidyarambham. Tens of thousands of children are initiated into the world of letters on this day in Kerala. In Telangana region of Andhra Pradesh, people celebrate Bathukamma festival over a period of nine days. It is a kind of navratri celebration. The Mother is adored as a giver of spiritual wealth, Lakshmi, who is considered to have the power of bestowing on her devotees inexhaustible wealth, as she is the goddess of wealth. The final set of three days is spent in worshipping the goddess of wisdom, Saraswati. In order to have all-round success in life, believers seek the blessings of all three aspects of the divine femininity, hence the nine nights of worship. Eighth day is traditionally Durgashtami which is big in Bengal. In some parts of South India, Saraswati puja is performed on the 9th day. Ayudha Puja is conducted in many parts of South India on the Mahanavami (Ninth) day with much fanfare. Weapons, agricultural implements, all kinds of tools, equipments, machinery and automobiles are decorated and worshipped on this day along with the worship of Goddess. The work starts afresh from the next day, i.e. the 10th day which is celebrated as 'Vijaya Dashami'. Many teachers/Schools in south India start teaching Kindergarten children from that day onwards. In North India, as the culmination of the Ramlila which is enacted ceremoniously during Dussehra, the effigies of Ravana, Kumbhakarna, and Meghanada are burnt to celebrate the victory of good (Rama) over evil forces on the 'Vijaya Dashami' day. During Navratri, some devotees of Durga observe a fast and prayers are offered for the protection of health and prosperity. A period of introspection and purification, Navratri is traditionally an auspicious and religious time for starting new ventures. During the eight or ninth day, Kanya Poojan, pre-pubescent girls are ceremonially worshiped.